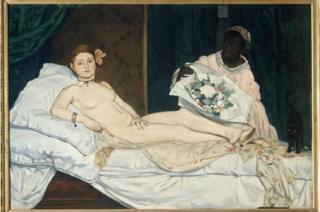 Manet's Olympia, painted in 1863, which depicts a naked reclining prostitute, has been renamed Laure after the woman who posed as her maid. American scholar Denise Murrell, one of the curators of the show at the Musée d'Orsay, said they aim to show how black people played a major role in the birth of modern art in Paris but were written out of the story. She said their identities were hidden behind "unnecessary racial references" such as negress or mixed-race mulatresse - which comes from the French word for mule. "This is emblematic. It was art history that left them out. It has contributed to the construction of these figures as racial types as opposed to the individuals they were," she added. It was painted in the period between the French Revolution's abolition of slavery in 1788 and Napoleon reinstating it in 1802. "For more than 200 years there has never been an investigation to discover who she was - something that was recorded at the time," Murrell said. The painter's favourite model, an art-loving Haitian man called Joseph, is the heroic figure standing on the raft.